As a project manager, you’re aware that your company needs to keep up with a constantly changing landscape, and traditional methods of project management aren’t always enough. Many companies stay ahead by using leaner, faster, and more experimental ways of driving production. There is no one definition of agile methodology. 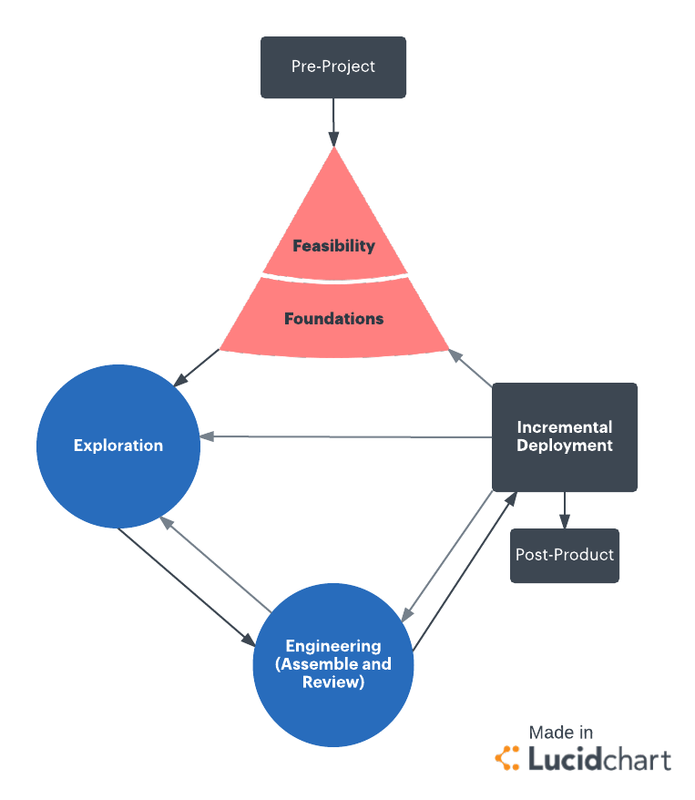 Rather, agile methodology is a mindset or way of approaching a project. Instead of planning and moving towards a delivery or launch date, the agile methodology breaks the developmental process into iterative steps, allowing for flexibility, testing, and change throughout the lifecycle of the project. Learn more about what agile methodology is and how you can apply these principles on your team. Agile methodology rejects sequential phases and relies on simultaneous, incremental work across various departments. Teams complete work in sprints, which are typically broken out into two-week chunks of time. Various checkpoints throughout the project allow the team to change direction as needed. By continually taking the temperature of the project throughout the process, you can deliver a better final product. Why choose agile as opposed to the traditional Waterfall method or other management styles? "There are three contexts in which being agile provide significant value—and key benefits in each context. Team members get feedback on their work and an understanding of how what they created had an impact, providing intrinsic benefit as individuals. Engineering organizations collectively become not only more efficient in their operations but also more effective in their delivery of value. Companies as a whole become more adaptive to changes in their markets and therefore more competitive—leveraging both the increased effectiveness and their newfound responsiveness." The various implementations of the agile method all rely on the ability of small teams to work independently and together to complete a project. In this setting, the team values face-to-face interactions over more passive means of communication, and individual participants are empowered to make decisions throughout the process instead of relying on top-down instruction or guidance. All the research, fact-finding missions, and studies in the world can’t compete with an actual working product. By focusing on developing and releasing multiple iterations of a product, and continuously testing those iterations, the team is able to respond to issues in real time and make corrections that ultimately result in a more refined final version. Nearly every project starts with a scope of work: an agreed-upon set of deliverables. The scope of work provides context and a reference point throughout the project, but it shouldn’t limit the conversation between stakeholders. An open dialogue and willingness to adjust as needed throughout the development process is the hallmark of agile methodology and leads to a better finished product. To better collaborate amongst your team, you may want to build out your scope of work in Lucidchart. Stakeholders and team members can leave comments or make edits if plans need to change. Click the template above to get started. As feedback and challenges arise, the agile methodology gives you the ability to adjust course. Instead of waiting until after a launch date to address bugs, teams are constantly releasing versions of their product, testing with real users, and fixing issues as they are identified. Putting agile methodology into action is very simple, and you may already use a form of this method, even if you don’t realize it. Everyone is familiar with making to-do lists, prioritizing items, and then putting their nose to the grindstone to cross things off. The agile method is just a more detailed and organized to-do list. In Lucidchart, your team can brainstorm features and then categorize them into these different categories in real time. Just click to open up the template below. Next, agile methodology requires the product team to estimate how long each feature or item will take to complete. During this step, the team also sets priorities so that the most important items are completed first. Once the team identifies features and organizes them by priority, the actual work can begin. 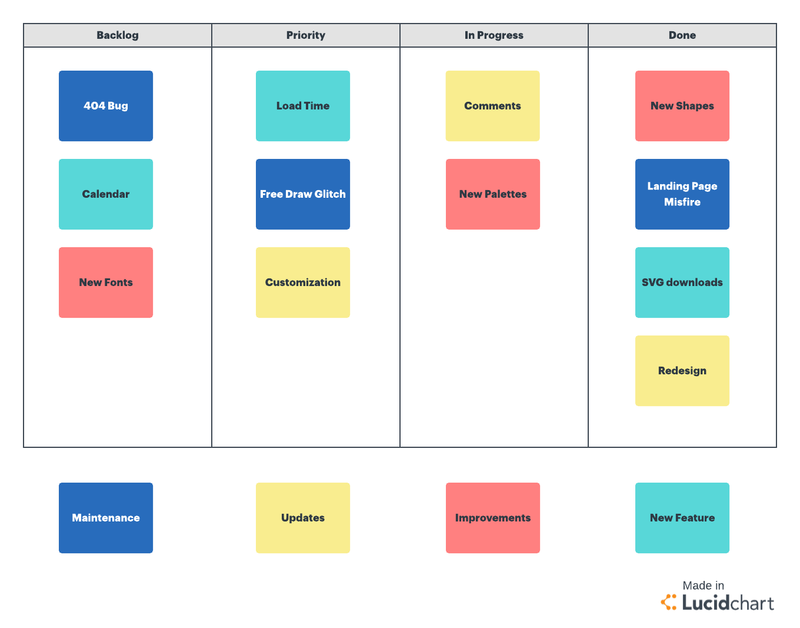 It’s important to set a schedule to determine which features to work on first, when products can be released for testing, and the timeline for incorporating feedback into the iterations. As work continues, the team adjusts the plan and decides if the pace and cadence of the project is comfortable for all participants or needs to be increased or decreased. There are many different ways to apply the agile method to development and project management. Here is a high-level view of the various subsets of agile methodology. This method relies heavily on constant feedback, self-management, small teams, and work broken out into sprints, or two-week periods of focused work. The sprint starts with a planning meeting to decide what tasks the team will accomplish during the two weeks. Teams typically hold a quick daily meeting to determine whether their goals are on track, and then they hold a retrospective meeting after the sprint to see what they accomplished and what they can improve next time. This subset focuses on eliminating waste from the production process, such as overproduction, defects, and waiting for the next production step, in order to speed up development and decrease cost. Teams who use Lean methodology depend on several tools to help them detect waste, including value stream mapping. To learn more about value stream mapping, read our blog post or try the template below. Kanban comes from a Japanese manufacturing method that uses instruction cards to communicate the project directive. This strategy shows work items in context of each other so the team can see which items take priority and can avoid committing to too many tasks at once. Chartering: Form a development team, determine how feasible the project is, and solidify your development method. Cyclic delivery: At this stage, you would build updates and release plan, integrate test iterations, and deliver the product to users. Wrap up: Deploy, perform a post-development review, and reflect. By examining various metrics of the agile methodology, your team can determine how effective your chosen agile method is. For example, examining the drag factor (the hours used during the sprint that did not directly contribute to the sprint goal) can identify where the team should change its processes and focus. You can improve drag by limiting the amount of non-vital work completed in a given sprint. You can also measure success by reviewing the number of bugs identified and remedied in an iteration, the actual number of hours used for a daily build, the number and frequency of tests able to be performed, and so on. As organizations use and refine the agile method, they begin to identify the most important metrics and processes for the greatest return. Gather requirements. As you meet with stakeholders, you can take down ideas in Lucidchart and move those boxes to prioritize the most important requests. Set a timeline. 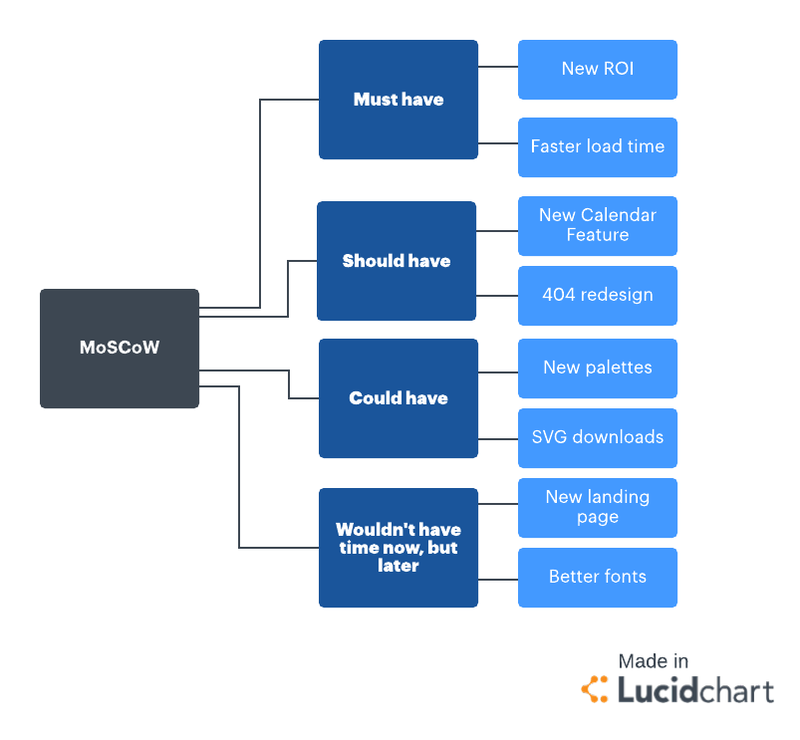 Lucidchart makes a great alternative to complicated Gantt charts. Divide responsibilities. With a swimlane diagram, you can sort tasks by person so everyone understands exactly what they need to accomplish. Keep everyone on the same page. It can be hard to explain the end goal of a project, especially when you develop software. 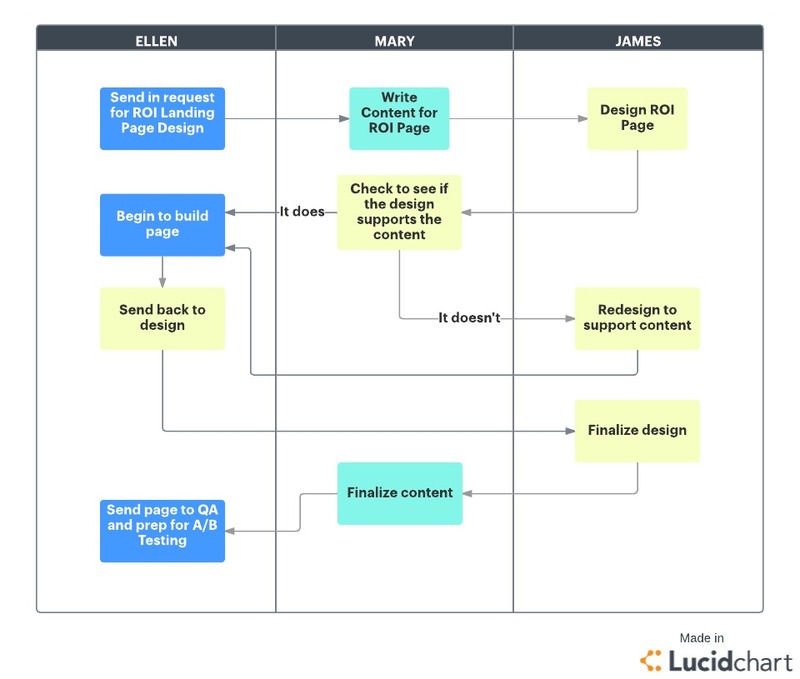 Create documentation in Lucidchart so other teams understand what the user experience should look like, how a product functions, etc. The best part is that you can easily share and collaborate on documents with your team. Start a free Team trial to see how you can incorporate Lucidchart and visual thinking into your agile workflow. Ready to improve team communication? Sign up for your Team trial now!